The DCU has introduced an entire separate multiverse…one full of nightmare versions of our favorite heroes. 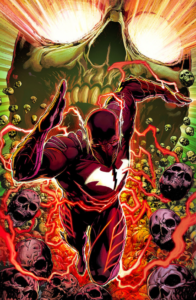 What happens when the Batman of one of those worlds decides to steal the Speed Force for himself? That’s what we see as the regular FLASH team of Josh WIlliamson, Carmine Di Giandomenico and Ivan Plascencia take on this METAL tie-in. There is a lot more here than meets the first glance…and if you want to know more just follow us after the jump! We are learning more about the nature of the Dark Multiverse in this issue. It’s full of worlds created from “every fear, each bad decision”, a whole multiverse of horrific “What if?” stories that are now fighting to survive. None of these worlds in the Dark Multiverse are meant to survive for long, even with their versions of the DCU heroes fighting to keep the worst from happening. Enter one terrible version of Batman. He’s stolen all the Rogues’ gear and upgraded them…all in an effort to capture that world’s version of Barry. Even in a horrific version of Central City, this Barry Allen is still a beacon of hope…but that can’t save him. Batman is determined to steal Barry’s link to the Speed Force, and to use it to save his world. …and that would be it except for the intervention of Doctor Fate, who whisks Barry away to safety. This leads us back to the rest of the METAL storyline, and of course to other tie-ins as well. NOTES: If anyone was going to write and draw this tie-in, we have the right team. I loved that Williamson kept the other world’s Barry as a beacon of hope, even in the middle of a nightmare version of the main DC Earth. It was a bit jarring to see Captain Cold’s specs on Batman’s cowl, but for the storyline it worked (although I wonder what he could see through his own cowl and the slits in those specs as well…just sayin’). This was excellent as a tie-in story – and I mean that as high compliment. So many tie-ins just jam a few pre-planned plot points into regular continuity without considering the consequences…not this one. When we come back to what is now called Earth-0, it all still fits in well. And, to be perfectly honest, I liked this story better than what I’ve read so far of the main METAL arc. I’ll give this one a 9/10 – what do YOU think? Leave your comments below! This entry was posted in Reviews and tagged Metal, Red Death, Review, The Flash on September 20, 2017 by Ed Garrett.